CHART OF THE DAY: Can The San Antonio Spurs Get To 70 Wins? If you watch SportsCenter, you would think it is a forgone conclusion that the NBA Finals will be a battle between the Los Angeles Lakers and the winner of the Eastern Conference Finals matchup of the Miami Heat and Boston Celtics. But while none of those teams have yet to win 40 games, there is one team that has raced out to 46 wins: the San Antonio Spurs. At 46-9, the Spurs are on pace for 69 wins. They would be just the third team in NBA history to reach that mark, last accomplished by the 1996-97 Chicago Bulls, who finished 69-13. But the magical barrier is 70 wins, a number that has only been reached once, by the 1995-96 Bulls, who finished 72-10. Can the Spurs become just the second 70-win team? 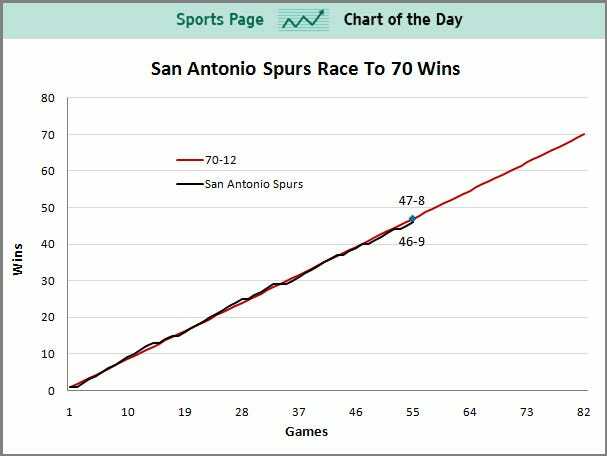 Currently, the Spurs are just one game off the pace to finish 70-12 (below). In order to reach 70 wins, they will need to go 24-3 over the final 27 games. The Spurs did start the season 25-3, so they are capable. But with a 7.5-game lead in the Western Conference, you can be certain that Gregg Popovich will get his star players rest down the stretch. Still, if the Spurs are in reach the final week, history may be too tempting.